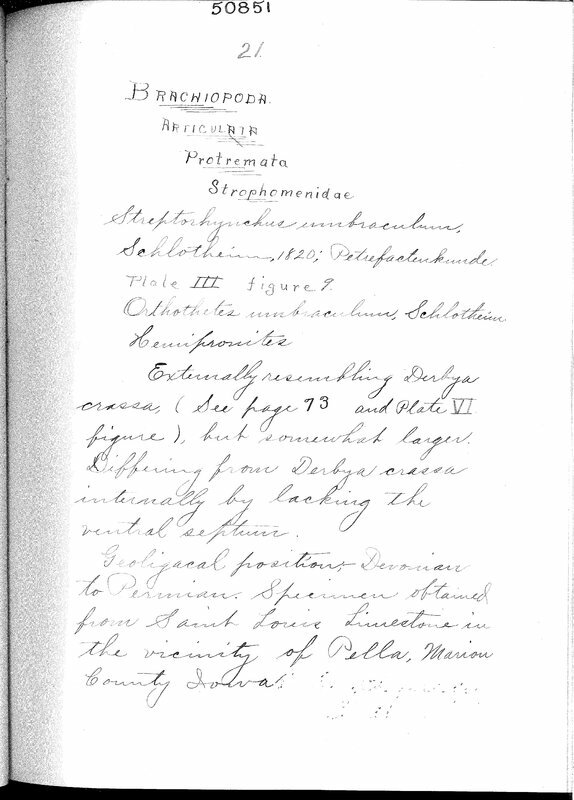 50851 21 BRACHIOPODA ARTICULATA Protremata Strophomenidae Streptorhychus umbraculum, Schlotheim, 1820; Petrefactenkunde Plate III figure 9. Orthothetes umbraculum, Schlotheim [Aeuriphorites? ], Externally resembling Derbya crassa (See page 73 and Plate VI figure), but somewhat larger. Differing from Derbya crassa internally by lacking the ventral septum. Geological location; Devonian to Permian. Specimen obtained from Saint Louis Limestone in the vicinity of Pella, Marion County Iowa.